After deciding on your Account Preferences, you will want to enter the custom values for some of those preferences such as genre, location and condition. Since book genres are fairly subjective, you will need to manually add your own genres. You will notice we have provided book subjects in the title details of each book from Booksource.com. The subjects are on by default for teachers but will need to be turned on for students if you choose to allow your students to see this information. We have left these off by default due to their sensitive nature. The subjects provided by Booksource.com are searchable if you choose to use them in your classroom. The location and the conditions of books are also dependent upon how your classroom is set up. This information will also need to be added manually. If you do not want to use this information in your classroom, simply turn them off by deselecting the box. 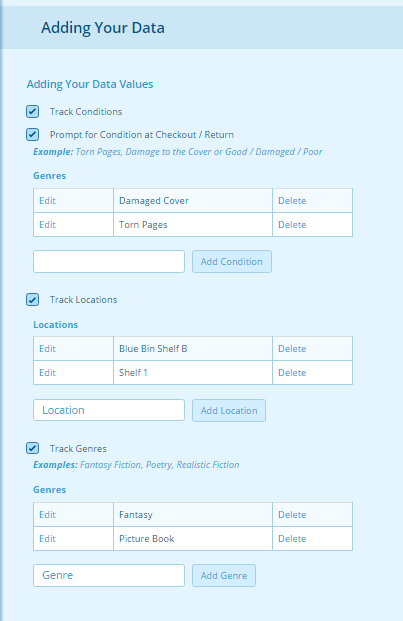 Setting up your conditions, locations and genres is as simple as checking the box next to each data value. Under each value there is a text box provided to enter your custom values one by one. Select the Add button after each entry to make the custom value available in your library. An example is below. To add genre, location or condition or turn off these features in your account go to Your Account/Adding Your Data.